John Chilembwe with his wife, Ida, and daughter, Emma, in a photograph probably taken between 1910 and 1914.
Who knows what he preaches in that church of his? Africa for the Africans, I suppose. in one murderous gesture I may not condone. of white hegemony in Central Africa. whose shiny liberal shoes walk over these memories. This is one such "strange survival". What happens to the structure of a revolutionary moment? 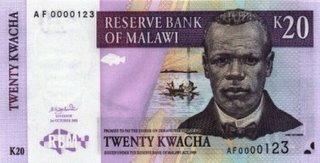 What happens to it when the leader appears on a bank note? Can the moment be "re-fired"? 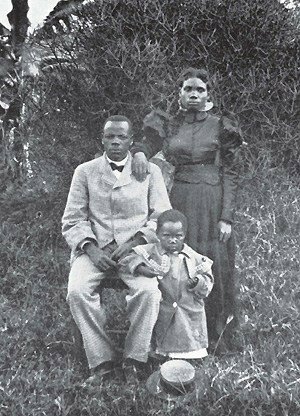 Time, not memory, and "all our paradoxes meet in Chilembwe's life." If they do, it is because the life of a rebel is endlessly chaotic, a patterning which cannot be resolved and so the poem must admit of continuous flaws. Oliver's structure, which combines the practise of historical description through first person narrative slants, Chilembwe's documentary voice and the chorus of readers, is designed to perform this re-firing amidst the paradoxes, zone of convergence. 'A Salvo for Malawi' is a poem in Douglas Oliver's A Salvo for Africa (Bloodaxe), and it is also included in the Iain Sinclair edited anthology Conductors of Chaos (Picador).